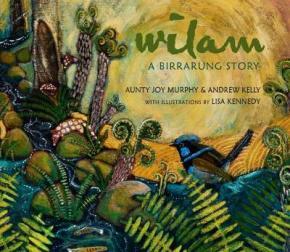 In this stunning picture book beautifully given form by Indigenous artist Lisa Kennedy, respected Elder Aunty Joy Murphy and Yarra Riverkeeper Andrew Kelly tell the story of one day in the life of the vital, flourishing Birrarung (Yarra river). Yarra Riverkeeper Andrew Kelly joins award-winning picture book duo Aunty Joy Murphy and Lisa Kennedy to tell the Indigenous and geographical story of Melbourne’s beautiful Yarra river, from its source to its mouth; from its pre-history to the present day. An ode to Australian rivers, the flora and fauna that live on them, and the function they perform as a part of modern day life. Wilam brings Aboriginal life, culture and language right in to the heart of the city.